Here’s a thought for the dullards in charge of the UK’s annual Eurovision efforts. Why not ask Serpentyne to sing for us next year? I have no idea what the self-styled ‘Medieval-World-Folk-Rock’ band would feel about that. But I do know that the rousing fusion of their beats and the Game of Thrones vibe of their spectacular act is more in tune with broader European musical tastes than anything we’ve entered in the last two decades. 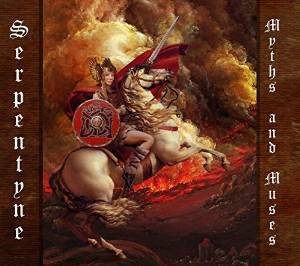 Their new album, Myths and Muses, is a rampaging set of epic tales told through the lead vocals of Maggie Beth-Sand, so evocative of great British female folk singers, from Sandy Denny to Anne Briggs and Shirley Collins. Back and forth we are swept, from the fiery story of Boudicca and the Iceni uprising against the Roman occupation of ancient Britain, to the legendary library of Alexandria, and on to an account of the Valkyries that elbows Wagner aside. There’s a Breton dance (“Douce Dame Jolie”), and several traditional English folk songs including “A Rosebud in June”, not forgetting Henry VIII’s convivial testament to “Pastyme with Good Company”. Comparisons with Steeleye Span are inevitable, particularly with the inclusion of the Span staple “Gaudete”. But Sand and Powell have mixed in their own arrangements, introduced new melodies and lyrics, and with the other versatile players of the band they bring a wide-ranging set of new influences and idiosyncrasies to the feast. There is a ferocity in their playing which binds electronics, choral settings and swirling strings into a glorious whirl, underpinned by irresistible thudding rhythms.